UHD MagGLASS is a high-performance screen guard with A-spec tempered glass with all superior specs. A+ Impact Rating - Its an ability for the glass to retain structural integrity after a direct impact of 6FT. Screen Sensitivity - IE responsiveness, Its a gauged in a side by side comparison of the touch input response time when used with/without the glass installed. Coverage - It should be fully covered and not let some area of display partially exposed once installed. Anti Spy Privacy - Keeps your personal and sensitive information from spying eyes on the go. Scratch Resistant - It features tough-as-nails true 9H hardness rating with dual tempered layering and reinforced shatterproof construction. Ease of Use - Every MagGLASS set includes screen guard and installation guide things such as microfiber cloth, dust remover, alcohol pad, a drop-in alignment applicator for bubble free installation every time. 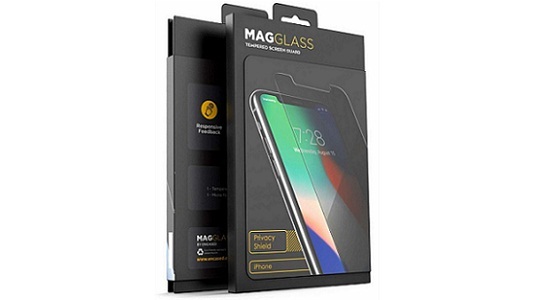 If you are looking for a world-class quality screen protector, make sure its MagGLASS!